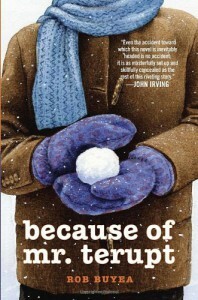 This book follows the story of the seven fifth grade students at Snow Hill School. Each of them narrates their own stories (school and personal experiences) and their own versions of how Mr. Terupt, their new teacher, made their classroom a fun place to learn until an unfortunate event that made an impact to the lives of those seven narrators. I was a bit skeptical at the start because there were seven narrators in this book. I have never read a book with so many narrators so I wonder how I will be able to connect with all of them. Fortunately, it wasn’t the case in this book. Buyea was able to make me connect with all of the narrators. As an adult, the fact they were all kids didn’t prevent me to connect with all of them. Each character had different stories to tell and I had so much fun reading their own stories on their own point of view. I admired Mr. Terupt for being such an inspiration to his students. He was such a cool teacher. The one his students could joke with but will also chastise them if need be. He had fun and creative ways of teaching his students and was able to involve his students to engage in his learning activities. This book is so relatable. It will remind us of lots of things we experienced at school. The fun and the not so fun experiences; the classmates and friends we have gained, even the bullies or the “mean girls” we’d encounter. And of course, it will remind us of our favorite teacher/s we admired and served as our role model at school and sometimes in life. I never thought I would enjoy this book so much. Not sure when I will be able to read its sequel though. #who says children’s books are for kids only?